Welcome to the TALES of JOY R.E.A.D.® Program Website! Tales of Joy R.E.A.D. 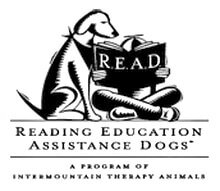 (Reading Education Assistance Dogs) is a reading intervention program that is used in Rio Rancho Public Schools elementary schools to assist children in improving their reading, social, and speaking skills by reading to dogs! Reading Has Gone to the DOGS!! CGC Certified – Registered Therapy dogs that is! Dogs are the ideal reading companions! ​Increases relaxation and lowers blood pressure. Children proceed at their own pace. Dogs do not judge, laugh, or criticize. TALES of JOY R.E.A.D.® Program is an Associate Program registered with Intermountain Therapy Animals. ITA launched R.E.A.D. in 1999 and has grown to hundreds of registered R.E.A.D. teams throughout the United States and Canada. “PAW” through our website and see how this amazing program improves the reading skills and overall well-being of the children that participate!